Recently I went to my grandparents’ house (Grandpa died in 2012 and Granny lived on alone there until her own death just a few months ago) and took things from it, amongst them two large bags of books, bound by my grandfather. On first arriving at my house, these books kept themselves to themselves; but now they are mixed with the ones that Grandpa gave me in his life, amongst them A. A. Milne’s When We Were Very Young and a Complete Works of Shakespeare from 1911 which, confusingly, belonged to my other grandfather and is inscribed to him on the fly-leaf. I can remember where each of the new books was in its old place, in their house: exactly where, on exactly which shelf and in which room. They represent probably about a fifth of the whole collection. I invented some criteria and made a selection. I say ‘took’ because it felt like taking, like theft. Can the dead be robbed? I was there in advance of an antiquarian book-dealer coming to take the remainder. And so, if it felt like theft, it also felt like abandonment; there were other orphans that I couldn’t re-home. Selection felt unkind. I once had a student (working on medieval scatology) who told me that, when his father died, his mother kept one of his father’s stools in a sample tube in her handbag for three years (is all research that autobiographical?). Somewhere between that and complete renunciation must lie a reasonable mean. I took literary books, barring the additional copies of Jane Eyre, Bleak House and Aesop’s Fables (of course it would be those three) and then a few things from the other categories: maths and science, history and geography and one Russian book. It was the Russian book which felt most illicit; I don’t read Russian. I also took a copy of the King James Bible, a Book of Common Prayer, and Brewer’s Dictionary of Phrase and Fable, which goes with the Bible because Grandpa, who wasn’t a religious man (‘religion just spoils what I think’, he once said to me), used them for the cryptic crosswords. That there were definite sections in Grandpa’s library reminds me that he also had criteria when he bought the books in the first place. Not only did he buy on particular subjects, but he also said that he would never pay more than £5 for a book, wouldn’t buy one that was less than a hundred years old, or that had a perfectly decent unbroken binding already. He didn’t stick to these criteria, though. 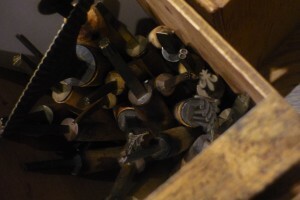 I don’t know about the price, of course, or what they looked like before he mended them beyond my memory of the poor flapping loose quires laid out on his work bench, but there are several that aren’t a hundred yet. The newest (and so oddest) is a now a beautiful, leather-bound copy of Edgar Allen Poe’s Tales of Mystery and Imagination, which would otherwise be a rather ordinary Wordsworth Classics edition from 1995, like a thing unaccountably put into the wrong box. But there are also editions of John Galsworthy’s Forsythe Saga and A Modern Comedy, not first editions but early ones from the 1920s and 30s. These newer books prick a memory of being a teenager and asking Grandpa to rebind a distressed copy of Tennyson’s poetry, from 1904, and feeling embarrassed. But it was nearly a hundred and he seemed to see what I saw in it, because he saved the art nouveau end papers and cut the avian cover design from the original binding and attached it to the new one. 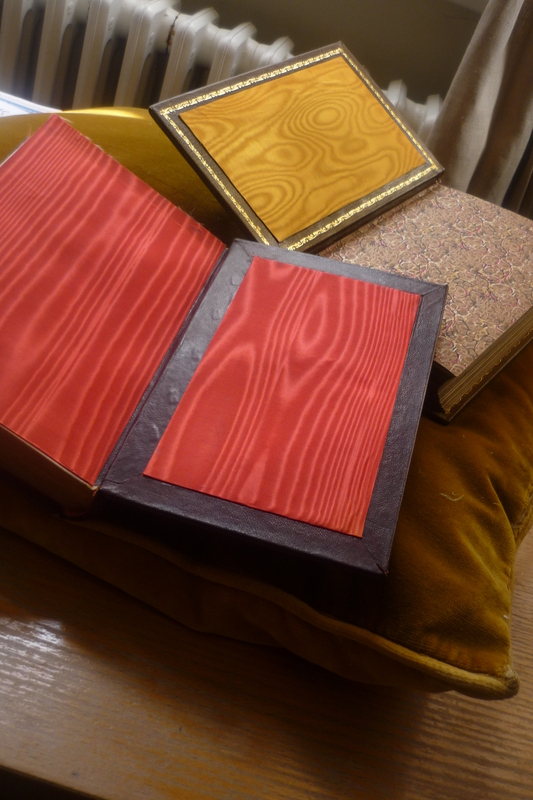 Later he gave me another, older copy of Tennyson’s verse, with a solid wood binding, mended rather than rebound. There are several books within the new lot that have pieces of their old binding reincorporated into the new like those editions of Tennyson: Fanny Burney’s Evelina and Elizabeth Gaskell’s Cranford, both have pieces of brightly-coloured washed silk over the end papers (Evelina’s is red, Cranford, yellow), although they’re not from the same series. 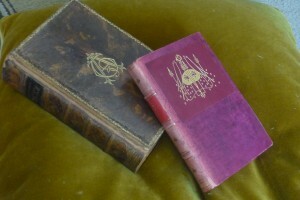 There’s no date in either book but both, I think, are from around 1900-5. A pretty little, again undated, copy of Jules Verne’s Journey to the Centre of the Earth retains parts of its first verdigris binding. And the one that I thought about as I was driving there to pick the books up, a 1882 copy of Bunyan’s Pilgrim’s Progress, has its old gilded binding laid like lace work over the new. Grandpa was a physicist (he studied at Manchester under Rutherford, Bohr and Hartree); he didn’t become a book-binder until his retirement. Perhaps the majority of books were on maths and science: on logarithms, the principles of measuring, Euclid’s geometry and other things. This not being my subject particularly, I took only two from this section: Charles Darwin’s Journal of Researches and a book written for children. I had my own son in mind as its future reader: The Fairyland of Science, by Arabella Buckley (published in 1880) which has such magical chapters as ‘sunbeams and the work they do’ and a ‘history of a piece of coal’. From the history section I took a little more, but not everything: an Atlas of Ancient Geography (1871); Frank Power’s Letters from Khartoum, Written during the Siege (1885); and a personal memoir of Tzar Nicholas I: What I Know of the Late Emperor Nicholas and his Family (1855). Which brings me back to the Russian book that I pilfered. Grandpa was a Russianist, being the only one who put his hand up when his wartime research unit were asked for volunteers to learn enough to translate Russian communiqués. ‘The New Lands’, Grandpa has helpfully embossed in English on the book’s spine and, in it, there are pictures of un-smiling, I think Siberian, people (1903). From the title and pictures I think I know what sort of book it is and I have friends and other family with Russian; so it isn’t stool- in-a-sample-tube crazy. What else is there? 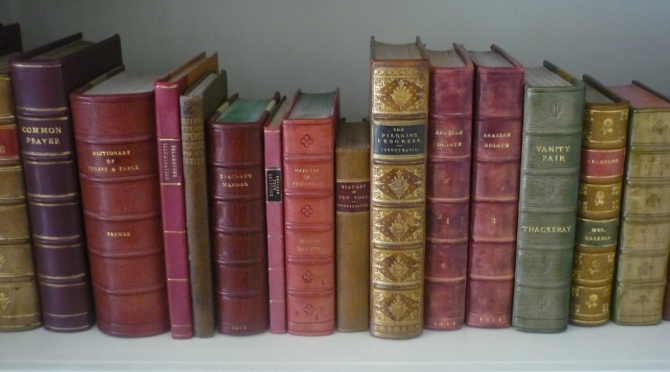 Lewis Carroll; some Dickens; novels by all three Brontës; Trollope; Hardy; Austen; Eliot (George, of course, not T. S.) and Thackeray; The Diary of a Nobody; Mrs Gaskell’s Life of Charlotte Bronte; a copy of Gulliver’s Travels with chromolithograph frontispieces from 1864, which must have been new and unusual; and Rider Haggard’s She with a purportedly authentic ‘facsimile’ of the ‘sherd of Amenartas’. There is a nice copy of Delamotte’s Primer of the Art of Illuminations (although a reasonably late one from the 1920s). The oldest of the lot, I think, is a two volume copy of Arabian Nights from 1813. This far famed and popular play has enjoyed a reputation with the public, which good taste and judgment have uniformly united in decrying. As a regular drama, it is undeserving of any praise; and the pleasure with which its performance is commonly witnessed, can be ascribed only to the splendour of its scenery and decorations. The tables had clearly turned; Julie A. Carlson describes it as the most popular play of the 1790s and the second most popular play of the eighteenth century (‘Trying Sheridan’s Pizarro’, Texas Studies in Literature 38 (1996)). Jane Gressier avails herself of this valuable medium to return her sincere thanks to her Catholic Friends, for the very liberal support she has received since the death of her husband, and begs to inform them that she is continuing the general Drapery Business at the above establishment, where she trusts by excellent of quality and reasonableness of Terms, to secure their future favours and recommendations. Amongst these hand-bound books I also picked up another, which is in its first binding and which Grandpa doesn’t even seem to have repaired. He must have bought it for itself. A History of New York, from Creation to the End of the Dutch Dynasty, purports to be by one Diedrich Knickerbocker and, if the author sounds fantastically named, that’s because he is, being the pen-name of Irving Washington. This edition (by Thomas Tegg and Son, in London) is from 1836, although the History was first published in 1809. 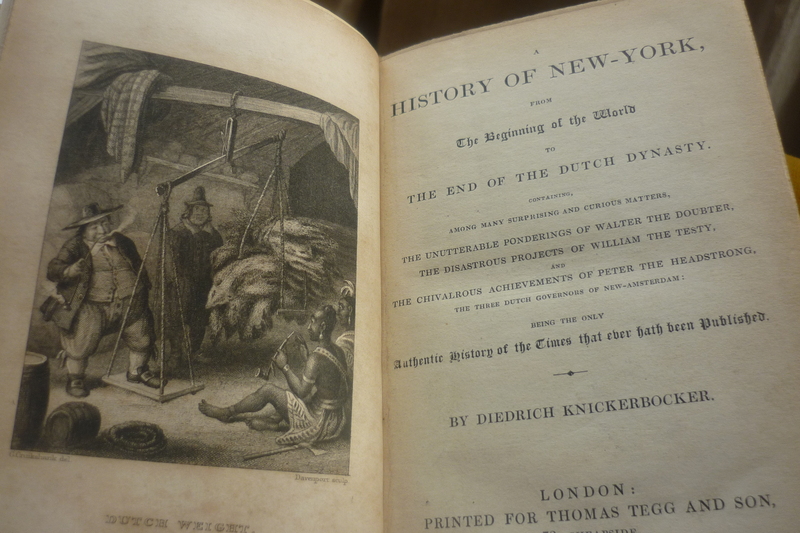 This is a picture of the frontispiece engraving, ‘Dutch Weight’, by Cruickshank, which depicts a fat Dutch colonist, ‘weighing’ a load of animal pelts brought to him by a native American ‘Manhatto’, which should give you a sense of the book’s satirical slant . A mock colonial history, the title page advertises the History’s bombast contents, ‘among many surprising and curious matters, the unutterable ponderings of Walter the Doubter, The Disastrous projects of William the Testy, and the Chivalrous achievements of Peter the Headstrong’. In October and November , Irving wrote and planted in the newspapers a series of hoaxing press notices. These introduce the reader to the ‘mysterious disappearance’ of ‘a small elderly gentleman’ from the ‘Columbian Hotel’ in New York. The gentleman is subsequently revealed as a Mr. Diedrich Knickerbocker, and we learn that he left behind in his hotel room ‘a very curious kind of written book. . . in his own handwriting.’ The imaginary landlord of the imaginary hotel, Seth Handaside, informs the public that he intends to ‘dispose of [the] book’ in order to ‘satisfy’ Knickerbocker’s unpaid bill. And so it comes to pass that A History of New York is published in early December 1809 in two volumes by Inskeep and Bradford. ~ ‘Washington Irving, A History of New York, and American History’, Early American Literature 47 (2012): p. 350. This is all, obviously, completely wonderful in itself. Yet, on top of that, the inscriptions in the front of the History tell of the book’s interesting journey to my shelf. An inscription in the book indicates that it was in Leeds, the property of a Louis Taylor in 1857 but, in the First World War, it ends up, we know from stamps on the endpapers, in the War Library of the British Red Cross, in the recreation hut of No. 7 convalescent depot in Boulogne. 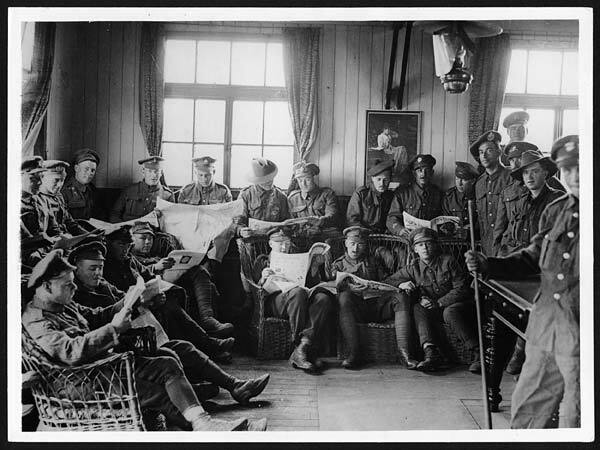 There are some photographs taken by the war photographer Tom Aitken of one of these recreation huts and of men reading in it. I look at these photographs and hope to see A History of New York if I look closely enough, but can’t. These were camps for the recovering wounded, on their way back to the front; I wonder what they made of the Knickerbocker History. Then somehow it got itself to Grandpa’s shelf and now it is here. The first 40 of Grandpa’s other books, the maths and science ones that I left behind on his shelves, have just gone on sale at Portman rare bookshop in Tonbridge. I almost didn’t take, but at the last minute phoned my mother, tired from a night going over all the others I’d left, too, and asked her to also put the five volumes of Boswell’s Life of Johnson to one side. The ones I didn’t save will be up for sale soon: the books about Lancashire, where grandpa was born in 1916 and brought up; those alternative copies I mentioned and many others that I now can’t remember. Even as I put in this hyperlink I know that it is temporary, a virtual connection to dwindling stock that will one day bring up other books, bound by others, as well or instead of his. If you buy one, let me know so I can know it’s on your shelf. I also took with me four boxes of embossing tools: a complete set of upper case and lower case letterpresses, full punctuation and numbers sets, plus fleur-de-lis and foliage presses. I remember using these as a child; my sister and I pressing our names into off-cuts to make bespoke bookmarks and labels for personalized boxes and notebooks. And when my son is old enough perhaps he will press his own name into a piece of leather and keep it warm in his pocket like a treasure; and maybe I will bind books in my retirement and keep these tools with jars of amber glue-beads and felt-lined vices, like Grandpa did. As I drove away with my stolen property, I wondered about my own materiality, my need to keep and own these lovely things. Characters in books who, one way or another, survive their own deaths, often look down and laugh at that need, at our connection to things, our silly unspiritual side. Because, for the dead, things literally don’t matter anymore. And I thought about Grandpa up ‘there’ (in the eighth sphere or wherever else the dead go) looking down and, although he had a childlike sense of humour in life, I couldn’t bring myself to imagine him laughing. Instead, I could very clearly hear him saying: ‘you are absolutely right, Isabel; it is the books: the books are what life is really all about’.